In 2003 a brand new virus named severe acute respiratory syndrome coronavirus (SARS-CoV) caused an outbreak of serious illness in Asia. The outbreak sickened over 8,000 people and killed over 700. Many of the infected were health care workers. In February of 2013 a similar but distinct virus was identified in Saudi Arabia, the Middle East respiratory syndrome coronavirus (MERS-CoV). 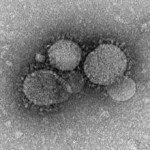 Here's what MERS-CoV particles look like as seen by electron microscopy (Credit: CDC/Wikipedia). Since that time about 200 people have been sickened by MERS, all linked to 6 countries in or near the Arabian Peninsula. The World Health Organization (WHO) has confirmed 180 cases (143 in Saudi Arabia) and 77 deaths (59 in Saudi Arabia). There have been no cases thus far in the U.S. No specific treatment or vaccine exists for MERS-CoV. Annals of Internal Medicine published a report by researchers in Saudi Arabia describing 12 patients admitted to ICUs with MERS-CoV. The description of the illness that emerges from details they report is scary. Eight of the patients contracted the illness in the community. Three patients were in the ICU for other reasons and were infected in the ICU, and one was a health care worker who presumably contracted the illness at work. The patients ranged in age from 36 to 83. The average time from the onset of symptoms to presentation to the emergency department was 1 day, and to ICU admission was 2 days. The majority of patients presented with shortness of breath, cough, and fever. Many of the patients had chronic illnesses, such as diabetes, high blood pressure, heart disease and kidney disease. All of them required being on a ventilator (a breathing machine). Their chest X-rays (which you can check out yourself in the article) looked horrible. They spent an average of 16 days on the ventilator. Seven patients had kidney failure requiring temporary dialysis. Eight patients had dangerously low blood pressure requiring medication to elevate it. Seven patients (about half) died. Neither the Centers for Disease Control (CDC) nor the World Health Organization recommends that anyone change their travel plans because of MERS. For now, it seems geographically quite localized and fairly difficult to catch. But no one can say what the future holds, and whether a few mutations from now MERS will be coming to an airport near you. If that happens, the rapid development of a vaccine will be critical. The small lesson is that MERS is an emerging pathogen that deserves our attention, and that what is simmering on the other side of the globe this year can be a global pandemic next year. The big lesson is that nature is a mixed bag. Nature brings us both rainbows and tsunamis, both my 10-year-old daughter’s amazing eyes and the norovirus that is keeping her home from school today. And every now and then Mother Nature invents brand new ways to kill some of us.